Vint Cerf: Widely known as the father of the internet. He is President of the ACM, Chief Internet Evangelist at Google, Chairman of the ICANN and many other influential positions. In addition to the Turing Award, he has also received the Presidential Medal of Freedom in 2005 and was elected to the Internet Hall of Fame in 2012. Bob Kahn: Worked at AT&T Bell Labs, MIT, then while working with BBN, he got involved with the DARPA and Vint Cerf and they together worked on packet switching networks, and invented the IP and TCP. The birth of the internet: TCP and IP. 70s and 80s. What did Vint Cerf and Bob Kahn do? Each network talked its own protocol, so they wanted a protocol neutral mechanism of connecting the networks. Each network had its own addressing scheme, so they had to invent a universal addressing scheme. Retransmissions to ensure reliable delivery. And duplicate detection. Paper in 1974 defining a 4 layered network model based on TCP/IP. NetHeads philosophy: network is dumb, endpoints are smart; open community; expect cheap or free services; no per-minute charges; want network to evolve organically without regulations. Switch to ATM circuit switching (and bypass the routing layer) if a long-running connection detected. Support for mobility is pretty bad with TCP/IP. What if you change your ISP, your machine, etc? Things that are not always connected to the network. For example, sensor networks, gadgets, remote locations. Another Example: remote villages in Africa have a bus visiting them periodically, and that gives them internet access for a limited time every day. Hardware Router only does packet forwarding, but end applications can update the routing tables of the router using the OpenFlow protocol. App has a OpenFlow controller that sends updates to the OpenFlow agent on the Hardware Router. Sham Navathe does not really need an introduction – since he is famous for his book “Fundamentals of Database Systems” written by with Ramez Elmasri, which is prescribed for undergraduate database courses all over the world. His full background can be looked up in his Wikipedia page, but it is worth mentioning that Navathe is a Punekar, being a board topper from Pune in his HSC. He regularly visits Pune since he has family here. Ted Codd studied in Oxford, initially studying Chemistry, before doing a stint with the Royal Air Force and then getting degree in Maths. He later emigrated to US, worked in IBM, did a PhD from University of Michigan, and finally went back to IBM. At that time, he led the development of the world’s first “multiprogramming system” – sort of an operating system. Codd quit IBM in 1984 because he was not happy with the “incomplete implementation of the relational model.” He believed that SQL is a “convenient” and “informal” representation of the relational model. He published rules that any system must follow before it could be called a relational database management system, and complained that most commercial systems were not really relational in that sense – and some were simply thin pseudo-relational layer on top of older technology. In 1963-64, IBM developed the IMS database management system based on the hierarchical model. In 1964-65 Honeywell developed IDS, based on the network model. In 1968, Dave Childs of Michigan first proposed a set-oriented database management system. In 1969 Codd published “The derivability, redundancy, and consistency of relations stored in large databases” (IBM research report, RJ-599, 1969). This was the work that led to the seminal paper, “A Relational Model for Large Shared Data Banks” (CACM, 13:6, June 1970). Other classic papers are: “Extending the Relational Model to capture more meaning” (ACM TODS, 4:4, Dec 1979), which is called the RM/T model. He is also the inventor of the term OLAP (Online Analytical Processing). After Codd’s proposal of the relational model, IBM was initially reluctant to commercialize the idea. Instead, Michael Stonebraker of UC-Berkeley along with PhD students created INGRES, the first fully relational system. INGRES ultimately became Postres database which is one of the leading open source databases in the world today. In the meantime, Relational Software Inc. brought another relational database product to the market. This ultimately became Oracle. After this, IBM heavily invested in System R that developed the relational DBMS ideas fully. Codd was involved in the development of System R – and most of the fundamental ideas and algorithms underlying most modern RDBMS today are heavily influenced by System R.
All of this was hardcoded in the program. And Codd wanted to simplify database programming by removing these dependencies. – Loss of programmer productivity due to manual optimization. Codd’s fundamental insight was that freeing up the application programmer from knowing about the layout of the data on disk would lead to huge improvements in productivity. For example, in the network or hierarchical models, a data model in which a Student has a link to the Department that he is enrolled in, is very different from a model in which each Department links to all the students that are enrolled there. Depending upon which model is used, all application programs would be different, and switching from one model to another would be difficult later on. Instead, Codd proposed the relational model which would store this as the Student relation, the Department relation, and finally the Enrolment relation that connects Student and Department. Of course, other operators from set theory can be applied to relations, but then the result will not be a relation. However, the operations given above take relations and the results are also relations. Thus, all the relational operators can again be applied to the results of this operation. Consistency / Inconsistency: Codd allowed the definition of constraints governing the data in a set of relations, and a database is said to be consistent if all the data in the database satisfies those constraints, and is said to be inconsistent if not. In the years that followed, a bunch of IBM research reports on normalization of databases followed. He points out that in relational data model, data can be addressed symbolically, as “relation name, primary key value, attribute name”. This is much better than embedding links, or positional addressing (X(i, j)). The relational data model encompasses structure, manipulation and integrity of data. Hence, it is a complete model, because all 3 aspects are important for data management. This was a remarkably prescient list. In the 30 years since this talk, most of this has actually happened either in commercial databases or in research labs. We have pretty much achieved #1 to #6, while #7 to #9 have seen a lot of research work but not wide commercial acceptance yet. Relational model is a firm foundation for data management. Nothing else compares. Proponents of NoSQL databases as well as map-reduce/hadoop type of systems need to keep in mind that large data management cannot really be done in an ad hoc manner. Codd’s RM/T model was an attempt to capture metadata management, but fell short of what was needed. Q: Why did object-oriented databases not catch on? A: There was a lack of understanding amongst the wider community as to the best way of using object-oriented ideas for data management. OODBMS companies were not really able to really educate the wider community, and hence failed. Another problem is that object-oriented DBMS systems made the data model complex but there were not corresponding developments in the query language and optimization tools. Q: When the relational model was developed, did they constrain themselves due to the hardware limitations of those days? A: Codd did mention that when deciding on a set of operations for the relational model, one consideration was ‘Which of these operations can be implemented on today’s hardware’. On the other hand, there were lots of companies in the 80s which tried to implement specialized hardware for relational/DBMS. However, none of those companies really succeeded. In the future, it is very unlikely that anyone will develop a new data model with improvements in hardware and processing power. However, new operators and new ways of parallelizing them will certainly be developed. Q: There are areas of data management like incomplete, inexact data; common sense understanding of data; deduction and inferencing capabilities. These are not really handled by today’s DBMS systems. How will this be handled in the future. A: There have been many interesting and elegant systems proposed for these areas, but non have seen commercial success. So we’ll have to wait a while for any of these to happen. Will be updated every 15 minutes. Please refresh regularly. I was invited to visit the Nvidia Tech Week this past weekend (February 25-26, 2012) at their facilities in Pune. This is a great concept – getting employees to invite friends and relatives to actually see what their company is all about is very good social outreach and a fantastic marketing initiative. If more tech companies in the area do similar events once or twice a year, it will help lift the shroud of technical opaqueness around them. I think hosting similar events in area colleges will also help students realize that even VLSI/Embedded Systems Design is cool. I was given a personal tour by Sandeep Sathe, a Sr. Development manager at Nvidia and also met with Jaya Panvalkar, Sr. Director and head of Pune facilities. There was enough to see and do at this event and unfortunately I was a bit short on time. It would have taken a good two hours for a complete walk-through, so I decided to spend more time on the GPU/HPC section though the Tegra based mobile device section was also quite impressive. It’s been a while since I actually installed a new graphics card in a desktop (actually, it’s been a while since I used a desktop), but graphics cards have come a long way! Nvidia is using standard PCI Express form factor cards for the GPU modules with on-board fans and DVI connectors. Here, Nvidia basically stretches the game graphics from a single monitor to three monitors. Great for gamers as it gives a fantastic feel for peripheral vision. The game actually doesn’t have to support this. The graphics card takes care of it. The setup here is that while the gamer sits in front of the main monitor, he also sees parts of the game in his peripheral vision in two other monitors that are placed at an angle to the main monitor. I played a car rally game and the way roadside trees, objects moved from the main monitor to the peripheral vision monitors was quite fascinating. This is similar to the above, but with 3D. You can completely immerse yourself in the game. This sort of gaming setup is now forcing monitor manufacturers to develop monitors with ultra small bezel widths. I suppose at some point in the next few years, we will be able to seamlessly merge graphics from different monitors into one continuous collage without gaps. Powerwall is a eight monitor setup driven by the Quadro professional graphics engine. Two Quadro modules fit into one Quadroplex industrial PC to drive four monitors. Projectors can also be used in place of monitors to create a seamless view. The display was absolutely clear and highly detailed. The Powerwall is application transparent. Additional coolness factor – persistence data is saved so you don’t lose the image during video refresh and buffer swaps. This is most certainly a tool intended for professionals who need high quality visuals and computing in their regular work. Examples are automotive, oil and gas, stock trading. PhysX is a graphics engine that infuses real time physics into games or applications. It is intended to make objects in games or simulations move as they would in real life. To me this was very disruptive, and highlight of the show. You can read more about PhysX here. It is very clear how PhysX would change gaming. The game demo I watched had several outstanding effects: dried leaves moving away from the character as he walks through a corridor, glass breaking into millions of shards as it would in real life. Also running was a PhysX simulation demo that would allow researchers to actually calculate how objects would move in case of a flood. What was stunning was that the objects moved differently every time as they would in real life. PhysX runs on Quadro and Tesla GPUs. It is interesting to note that Ra.One special effects were done using PhysX. Next couple of demos demonstrated 3D TV and photo technology using Sony TVs and a set of desktops/laptops. Notably, the Sony 3D glasses were much more comfortable compared to others. Nvidia is working with manufacturers to create more comfortable glasses. There was also a Toshiba laptop that uses a tracking eye camera to display a 3D image to the viewer regardless of seating position without glasses. It was interesting. However, the whole 3D landscape need a lot of work from the industry before it can become mainstream. What was explained to me was that Optimus allows laptops to shut off GPUs when they are not needed. They can be woken up when high performance work is required. This would be automatic and seamless, similar to how power delivery is in on a Toyota Prius. This sort of a technology is not new to computing – a laptop typically puts a lot of components to sleep/hibernate when not being used, but the GPU is not included. This allows 2D/3D visualizations for automotive, architectural and similarly complex systems for up to one thousand users at a time. You can easily change colors, textures, views so everyone can comment and give constructive feedback. I was not sure if the design can be changed on the fly as well. Nvidia is working with ISVs like Maya and Autodesk on this. Tesla GPUs use chips that are used for high performance computing and not rendering, which is different from what Nvidia typically does. The Tesla modules do not have any video ports! It has a heterogeneous GPU/CPU architecture that saves power. In fact, the SAGA-220 supercomputer, dubbed India’s fastest, at ISRO’s Vikram Sarabhai Space Center facility uses 2070 Tesla GPUs along with 400 Intel Xeon processors. In addition to supercomputing, Tesla is very useful in 3D robotic surgery, 3D ultrasound, molecular dynamics, oil and gas, weather forecasting and many more applications. Next few demos showcased the Tegra mobile applications processor based on ARM Cortex A9 cores. The HD quality graphics and imaging were impressive. It is clear that smartphones and tablets of the day are clearly far more powerful compared to desktops of yesteryear and can support highly impressive video and audio in a very handy form factor. In all, I had a great time. As I mentioned earlier, Nvidia along with other tech companies in Pune should hold more of these kinds of events to give technology exposure to the larger population in general. I think it is important for people to know that the stuff that makes Facebook run is the real key and that is where the coolness is. Suhas joined BMC Pune and was given the job of creating an innovation incubator within the company. This was the second attempt at creating an incubator in BMC. A previous attempt had failed spectacularly. The previous one had been started with great fanfare, with a 100 people team, and over time, it went down to 80, to 60 to nothing. With this history Suhas started his incubator with zero employees, and minimal fanfare. Suhas defines innovation as “Ideas to Cash.” This is important. The focus on cash, i.e. revenues, was an important difference between this incubator and the previous incubator, and also other research labs in companies around the world. Invention for the sake of invention, research for the sake of research is something that they definitely did not want to do. The wanted to ensure that everything they do has a direct or indirect revenue impact upside for BMC. There actually exists a document called “The Oslo Manual” which is a set of guidelines for how to do innovation. It is a free PDF that anyone can download, and Suhas recommends that to anyone interested in innovation. The incubator is a separate team who can focus on these issues. It is a small team (about 25 people) compared to the 200 people in just one of the product groups that BMC has. And these 25 people try various different innovative ideas, 9 of 10 of which are bound to fail. But even that failure adds value because that means there are 9 things that the 200 people product team does not have to try out – hence they’re shielded from dead ends and unproductive explorations. How to measure innovation? Number of patents is not a good enough metric. Motivation: the motivation for the incubator and the people on the team must come from within. Creating the motivation, and staying motivated, in the face of 9 failures out of every 10 ideas tried, is difficult. Difficult skill set: the team needs people who are smart, intelligent architects, but also hands on developers, with ability to switch context frequently, understanding the overall BMC vision, ability to sell/market ideas internally, and most importantly they need to be technology as well as business savvy. Finding people like this is a tall order. The incubator only does small projects. There are two kinds of projects: “research” and “prototype”. Research projects which are just 1 person 1 week, where that person is supposed to study something for a week and come back with a report. Prototype projects are just 2 or 3 people working for a maximum of 2 months to build a prototype – not necessarily a shipping product. The prototype should prove or disprove some specific hypothesis, and there is a tricky balance to be made in deciding which parts of the prototype will be “real” and which parts will be simple mocked up. From technology incubation, they want to move to co-innovation, where they work in conjunction with product teams, and customers to innovate. After that they would even like to do business incubation – where the product team is not interested in looking at an adjacent business, in which case the incubator would like to have the ability to go after that market themselves. The Indian IT industry, from humble beginnings, is moving up the value chain. Q: The incubator needs people who understand the current products thoroughly. Which means that you need to steal the stars from each product team, because you cannot really hire from outside. And obviously the product team is not willing to give up their stars. How do you solve this problem? A: In general, trying to get stars from the product teams is not possible. You wont get them, and you sour the relationship with the product teams. Instead, what works is to hire the smartest outside people you can hire and then make them learn the product. These people are then teamed up with the right people in the product team during the ‘learning’ process. The learning process is still a bit ad hoc and we haven’t yet formalized it, but at the very least it involves doing some work hands-on. Q: What do you answer when a product team asks what is the value you are adding? Q: How are you engaging in academia, and what else would you like to do? Q: Customers are in the US. Product Managers are in the US. And you cannot innovate unless you understand customers and have close ties with the Product Managers. How do you do that sitting in India? The head of the incubator must be the ultimate product manager, and more. First, s/he must have almost as much understanding of the market and the customers as the product manager of the actual product. In addition s/he must have a vision beyond just what customers want, so that they are able to generate innovative ideas. Successful engagement and understanding of Product Management is key to success of an incubator. All prototype projects require buy-in from the product team and other stakeholders, agreeing tentatively that if the prototype is successful, the product team will actually put that project onto the release schedule. Once the prototype is completed, it is incorporated into the release schedule, and the 2/3 people who worked on the prototype transition into the product team temporarily. There are two different mindsets for humans: Fixed Mindset and Growth Mindset. People with a fixed mindset use events as opportunities for assessment and validation of what they’re already doing. Those with a growth mindset use events as an opportunity to learn. Thus, the potential of a person with a fixed mindset is known, whereas the potential of a person with growth mindset is not only unknown, but also unknowable. The key difference between the fixed mindset and growth mindset is how they think about natural talent vs effort. In general, as a society, we tend to value natural talent, and effortless accomplishment. But what’s so heroic about having a gift? Effort ignites ability and turns it into accomplishment. Note: just because someone is talented and can accomplish things effortlessly, it does not mean that we should think less of them. But we shouldn’t give them more credit just because they did it effortlessly. A person with a fixed mindset thinks that if you need to put in effort then you’re not talented. And they are terrified of putting in an effort, because what if you fail even after put in effort? Thus, failure is a setback, and they tend to blame it on someone else. On the other hand success is about being gifted and is validation of being smart. They have a sense of entitlement. They get a thrill from doing things that are easy for them, and their self-esteem comes from being better than others. By contrast, a person with a growth mindset thinks of effort as the main driver of success. They are terrified by the idea of not capitalizing on opportunities. Failure does hurt them, but it does not define them. It is taken as an opportunity to learn and improve. So success is about putting effort and stretching yourself, thrills come from doing hard things, and self-esteem come from being better than yesterday. So, in the long term, growth mindset brings more success, and also helps you stay at the top. Not performing up to standards should be seen as an indicator for further learning. Psychological research shows that people who are told they were brilliant become more conservative (because they want to conserve their “brilliant” image) whereas people who are praised for their effort put in more effort the next time. Bottomline: negotiators, managers, leaders are made not born. Any ability, including artistic ability can be learnt. And does not really take very long to learn. Failure is the key to learning, and achievement, and ultimate success. J.K. Rowling, author of the Harry Potter books, gave a great commencement speech at Harvard talking about The Fringe Benefits of Failure, and the Importance of Imagination. The basic claim is that success in school/college, resulting in a well paying job, is actually a deterrent to success – because you will no longer be willing to leave your comfort zone and take risks. Nitin Deshpande of Allscripts talks about an incident from the early part of his career: a person who was considering offering a partnership to Nitin asked Nitin whether he had ever failed at anything in life, and when Nitin said that he hadn’t really failed at anything, he was told that he was not qualified to be a partner. A fixed mindset will limit what you can achieve with your ability, whereas a growth mindset will help you realize the full potential. Pune is still not as crowded as Bangalore, so growth is still possible in Pune. Overall, these are the advantages that Pune has for driving innovation. [Kiran] Our Pune center had lower attrition than other cities. This was a huge advantage. [Tarun] 23% of BMC is in Pune. Largest in the world. This gives huge advantages – having many different teams in one location. This is easier to achieve do than in other cities. [Omkar] Pune has an advantage over Bangalore that it still has space to grow. In Bangalore, it is very difficult to find space. [Tarun] Pune definitely has a better perception of quality of life compared to Bangalore. It’s still a small city compared to Bangalore – you can get anywhere in 30 minutes. And the culture and art is great. [Akila] Pune and Germany have had a great relationship, because of the auto industry. Pune has the largest concentration of German companies in India. This is a great opportunity for Pune’s software industry – it needs to leverage this and grow the software market in Europe. [Kiran] The great thing about the Pune Community is that all the different groups (Software Exporters Association of Pune (SEAP), PuneTech, TiE, Pune Open Coffee Club, Head Start, CSI Pune) all talk to each other and co-operate. [Akila] Pune’s demographics are interesting – lower than average age, and higher than average per capita income. It is easier to find early adopters in Pune, and easier to do viral (i.e., cheap) marketing in Pune. For example, it is not a surprise that it is the gaming capital of the country. Capturing Value: Making sure that your product is appropriately priced. It is not necessary that you charge for the product immediately, or at all. You might make money somewhere else. Delivering Value: Making sure your product / value reaches the right person. Having the correct Channels. The rest of this talk will focus on mostly on Market Analysis. Surveys: very few people do surveys. And it is easy to do. The only thing difficult is to come up with good survey questions. But otherwise this is one of the best and scalable techniques for market research. Ethnography: watching your customers in their natural setting. In Big Bazaar there are always people standing in a corner of the store and observing customers. They spend 8 hours watching the patterns. Why is social media is a great tool for market research? Getting real users in a the real world is a lot of effort. Easier to get users online: LinkedIn, Facebook, Blogger, Quora, Twitter, etc. Asychronous. You and the users don’t have to be in the same place at the same time. Makes it much easier. Great resource. All people in professional settings are on LinkedIn. Hence, for product management, especially enterprise products, this is a great resource. Very easy to create surveys / polls on LinkedIn and ask questions about your potential future product / features, and get responses from people all over the world. With demographic information from LinkedIn. You can not only get quantitative results, but also qualitative results and opinions. In addition, you get to go back and give updates to all those who participated about what happened, what features were included, etc. Audience Question: What about competition finding out about your product ideas / features? Answer: This is a problem with all market research. But in most cases, the idea is not the most important part of the product, so it’s OK. If indeed your idea is the secret sauce, then don’t include it in your market research, but in most cases it is no. If you are a product manager, you must use Uservoice. Similarly there is CustomerVoice, an Indian Startup similar to Uservoice, but for India. Facebook likes are not a good substitute for Uservoice. You need really granular feedback, which a “like” does not give. A landing page can be created within 5 minutes of creating an idea. Just put up your idea, ask people to register for the beta. At this point, you don’t have a beta, but you can decide whether to create one or not based on the amount of interest you generate. Think of a product. Assume that the product already exists, and create an ad for the product. Put the ad out. Target a few important cities and sectors (e.g. Bangalore, Delhi, Pune, Chennai). See how many people click on the ad, and from which city and sector. That will give you an idea of how much interest is there for your product, and which geographies and sectors your product should target. Do not start building a product unless you have done this. Google Ads are good for validating a concept, but not very good for getting an idea of the people who clicked on the ad. LinkedIn ads cost more, but provide much more details about the click-throughs. Make sure you have Google Analytics installed on all your websites. It is free and gives you lots of data on who’s coming and what they’re doing. In addition there are paid services (often fairly inexpensive) that do even better. For example, there is an Indian startup called Wingify that allows you to do A/B testing on your website. If you don’t know what A/B testing is, find out now. Samuel Colt, who invented the revolver, said that his invention was one of the most important things ever. Because, he said, “God made men. I’ve enabled them to be equal.” The person without strength, money, knowledge, can still win if s/he has a revolver. Social Media is the revolver for product management. Anyone can do it now. Don’t let this weekend end without sending out a survey. The Software Exporters Association of Pune (SEAP) has a book club which meets on the first Saturday of every month where one of the members presents a summary of a pre-selected book. Since the members and the presenter are usually senior managers in Pune’s IT companies, the books chosen are usually management books. After you read this book (or a book), you cannot put all of the concepts into practice all at once. Instead, you should pick just one area where you want to improve, and then just focus on it. Don’t do too much at once. A crucial conversation is a conversation you have with someone which transforms a relationship, and creates a new level of bonding. This is not a conversation for someone trying to be popular – a politician. This is not a conversation where you agree with everything the other says. A crucial conversation between two people with differing opinions, and where the stakes are high, and emotions run strong. You have to tackle tough issues, and the result can have a huge impact on your quality of life. Anecdote: people with life-threatening diseases were broken up into two groups, and the authors taught crucial conversations’ techniques to one of the groups in 6 sessions. At the end of one year, only 9% of this group had succumbed to the disease, while 30% of the other group had died. Start a high-risk conversation with the right motive, and stay focused on that motive no matter what happens. Often you are not clear on what you really want. Silence: Avoiding, withdrawing. Or even sarcasm and sugar-coating. Something external happens. You react to that. Then you get an emotion. In other words: when something external happens, your brain tells you a story related to that event, and then you get an emotion. To fix the emotion, fix the story. e.g. Wife finds a credit card receipt for a nearby motel for husband’s card. Story she tells herself he went there with someone. Then blows up at him. In case of “command”: don’t pass orders like candy. Explain why. Know when a vote is needed. Question: What if one person feels that the conversation is crucial, but the other does not? Example: I feel a conversation is crucial, but boss does not. Should we treat all conversations as crucial? Audience Reactions: 1. You can’t treat every conversation as crucial, otherwise you’ll get tired. 2. A boss just has to get used to the fact that every conversation with a subordinate is crucial. 3. If the other person’s emotions are not running high (i.e. s/he does not see it as crucial), that’s actually a good thing, since things will not blow up. Question: This seems like too much to learn and digest. How would you pick what are the first things to take away from here. Related: When I read books like this, I remember only 10%. How do you pick up more? Audience Reactions: 1. When you read something like this, keep track of what you already know, what you’re already good at, and what are the areas where you need to improve, and pick only those to work on. 2. Don’t just read the book. Sign up to present it to someone – that way you’ll learn much more. Product management means many different things to many different people, and is in fact quite different depending upon whether the product is new or mature, whether the company is small, medium or large, whether it is an enterprise product or consumer product, and a host of other things. 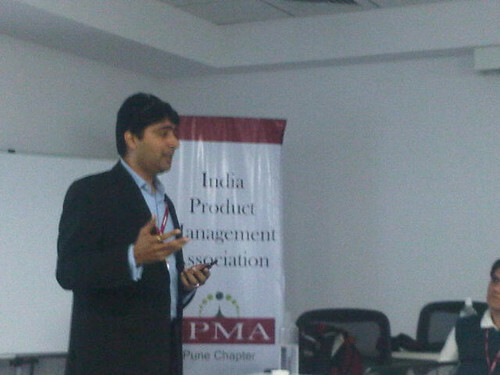 A lot of issues that product managers need to keep in mind, and skills that they need to develop was covered in Vivek Tuljapurkar’s IPMA Pune Talk covered by PuneTech earlier. Product Management is not a well-defined role or a group or even a person in a small company. Focus is only on sales and development, and product roadmap is decided in an ad hoc fashion. As number of customers, and breadth of solution increases, the ad hoc processes start to break down. Must create a Product Management as a layer between developers and customers. And everybody views this as bureaucracy and added overhead. This can only be done if there is strong backing from someone for the PM role. For example, the development team might get hassled by all the ad hoc requests that come from the sales organization, and will insist that a PM group be created and that all requests are channeled through PM. This is internal change management and it takes time to settle down. Recruiting product managers – biggest challenge. Most of the time, you don’t really know what you’re doing – you’re just trying to do a good job in the face of uncertainties and ambiguity. A PM must be paranoid. You need to worry about everybody and everything, because whenever anything goes wrong because of anybody, it ultimately comes back to you. So keep track of what various development teams are doing, what potential problems are. You need to keep track of sales teams, and what they’re promising customers, and how they’re positioning the product. You need to work by influence. The people who can make your life miserable (sales, dev, etc.) don’t report to you, but still you need to make sure that they listen to you. All PMs need to be entrepreneurial in their thinking – jugaad is needed at all times. Because things are always broken or breaking as far as a PM is concerned, problems to be solved, fires to be put out. Blaming others is not the answer. Ultimately the buck stops with PM, so PM needs to solve the problem, irrespective of who or what caused the problem. Relationship management is the key. If you maintain good relationships with various stakeholders, your life will be easy. You are constantly in “sell” mode. You need to convince sales people to do some things, and consultants to do some things, and development to do some things. Skills required for PM in small companies are different from those required for larger companies. Small companies are ad hoc, with tactical goals, with a narrow focus, and a consultant/developer mindset. Large company PMs are process driven, worry more about long-term strategic goals, have a broader focus, and think more like sales people than developers. Do not make the mistake of hiring “experienced” PMs from large companies for doing a small company PM job. This usually does not work well.